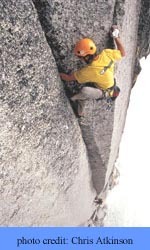 Being a Canadian Rockies climber bred on shattered limestone and blocky quartzite, I spent the spring and summer road tripping determined to learn how to crack climb properly. After a couple months of Indian Creek hand jams and Squamish finger locks, Matt Maddaloni and I hooked up for a week of Bugaboo granite. This was Matt’s first excursion to the Bugs and was understandably blown away. He figured he shouldn’t do a new route until he had climbed a classic, so within an hour of being at camp, he ran off and soloed the Becky-Chouinard Route on South Howser Tower in less than 4 hour round trip for his first Bugaboo experience. With that out of the way, we could focus on the unclimbed northwest face of Wide Awake Tower in the Pigeon Feather group. This 1200-foot Rostrum-like pillar of splintered granite had been looked at, talked about but not attempted due to its remoteness and apparent difficulty. Over six days, we aided, cleaned, scrubbed and fixed ropes then freed the pitches (on lead) as we went until we were close enough to blast for the top. 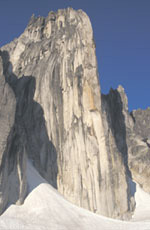 This “aid-point” style produced a high quality, eleven-pitch free route with six pitches of overhanging 5.11 crack climbing. Highlights include Matt’s send of two 5.11+ pitches: Pitch 1 being power under-clinging protected by a mix of bolts and fixed pitons and pitch 3 being an overhanging, enduro thin hands to fist crack. We named the route “Wild Fire” (V 5.11+) after the numerous out-of-control forest fires that blazed all around us in the valleys below.